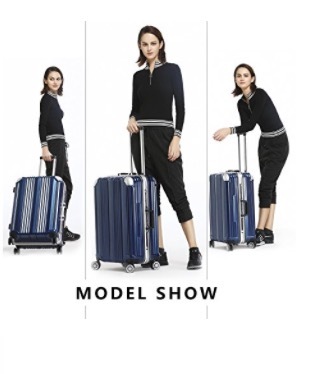 The Coolife 3 Piece Aluminium Luggage Set that is being reviewed on this page is a sturdy and functional hot new release travel item that is built with great quality materials. 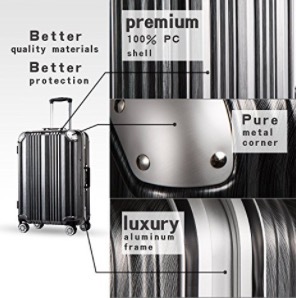 It includes the three sizes of solid luggage with a sturdy, luxury aluminum frame and the hundred percent German Bayer PC material shell. This Coolife set is offered in five color options of black, blue, purple, silver and wine red. It has a shining exterior and interior with the top-notch full rayon lining and luxury aluminum frame with brushed finishing, that ensure both beautiful appearance and durability. This is a TSA lock model and with the two-direction deep frame of the TSA system, you will feel more at ease and safe through your different travels. It has the internal pockets for multi-use to help you better organize and protect your clothes and other belongings- smaller essentials. It includes the 8 x very good quality aircraft type double spinner wheels that rotate in all directions. And you can wheel them on any solid ground, through the parking areas and airport buildings. You have the pure metal- hard aluminum corners to protect it better from any potential impact. The aluminum telescoping handles are adjustable to three different heights for shorter or taller people and will help make the suitcases feel more robust and lighter. You will feel almost no weight on your arms and all the three suitcases are very easy to maneuver. The German PC material is much lighter than the regular ABS material used in other units, but is so much more resistant to impact, no matter how hard it may be. The aluminum on the frame is also not a heavy material and helps the unit stay lightweight. The largest 28-inch suitcase weighs 11.5 pounds, measures 32 x 12 x 23 inches, with a 93-liter capacity. The 24-inch mid-size luggage weighs 9.7 pounds, measures 28 x 11 x 17.5 inches, with a 60-liter capacity. And the smallest carry-on cabin luggage weighs 7.3 pounds, with the dimensions of 22 x 9 x 15 inches and a 38-liter capacity. This is a very solid set that you can use many years even if you’re a frequent traveler. Zippers and wheels will withstand the wear and tear very well. The wheels will be fine even if you roll them a lot on rougher surfaces. And you’ll not be likely to see any scratches or damage on the suitcase from impact over time. The small one fits into the medium and the medium into the large suitcase and they are shipped this way. The instructions manual seems to be written by a non-native speaker and although it is easy to understand, it includes some weird phrases and words. 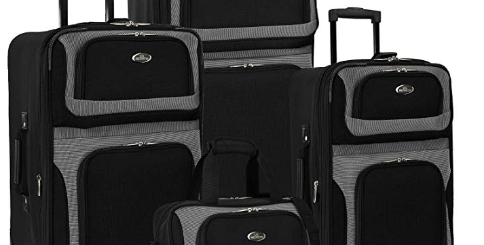 And it is not a cheap luggage set, but for being so light in weight and very sturdy at the same time and very nice looking as well, it is well worth the cost. This Coolife Metal Luggage Set is offered with a three-year global warranty by the manufacturer.